← Did you know we have a Diamond Trade-Up program? Picking out a Diamond? Do you know the 4 C’s? A good understanding of diamonds is necessary before you begin shopping for them! Yes, you’ve probably heard about the 4 C’s of diamonds, but do you know what they are? They are Cut, Color, Clarity and Carat-Weight. Diamond cut is perhaps the most important of the four C’s, so it is important to understand how this quality affects the properties and values of a diamond. A good cut gives a diamond its brilliance, which is that brightness that seems to come from the very heart of a diamond. The angles and finish of any diamond are what determine its ability to handle light, which leads to brilliance. The cut of a diamond refers to its proportions. Of the 4C’s, the cut is the aspect most directly influenced by man. The other three are dictated by nature. A diamond’s ability to reflect light determines its display of fire and brilliance. Diamonds are usually cut with 58 facets, or separate flat surfaces. These facets follow a mathematical formula and are placed at precise angles in relation to each other. This relationship is designed to maximize the amount of light reflected through the diamond and to increase its beauty. When a diamond is cut to proper proportions light enters through the table and travels to the pavilion where it reflects from one side to the other before reflecting back out of the diamond through the table and to the observer’s eye giving it a very satisfying sparkle effect. This light is the brilliance we mentioned, and it’s this flashing, fiery effect that makes diamonds so mesmerizing. When the cut of a diamond is too deep, some light escapes through the opposite side of the pavilion, resulting in an overall dull appearance. When the cut of a diamond is too shallow, light escapes through the pavilion before it can be reflected, again resulting in an overall dull appearance. Which Grade of Cut Should I Buy? This cut is intended to maximize brilliance, and the typically smaller table sizes of these diamonds have the added benefit of creating a great deal of dispersion or ‘fire’ as well. This category applies only to round diamonds. In the case of round diamonds, many Premium Cut diamonds have cuts that are the equal of any Ideal Cut diamond, though they often can be purchased at slightly lower prices than AGS Ideal Cuts. They are intended to provide maximum brilliance and fire. These diamonds reflect most of the light that enters them, creating a good deal of brilliance. With these diamonds, the cutters have chosen to stray slightly from the preferred diamond proportions in order to create a larger diamond. The result is that these diamonds fall slightly outside of some customers’ preferences in terms of, for example, table size or girdle width, though, in many cases many of the parameters of diamonds in this range will overlap with certain parameters of diamonds in the Ideal or Premium ranges. Generally, the price of these diamonds in slightly below that of Premium cuts. A diamond graded as fair reflects only a small proportion of the light that enters it. Typically these diamonds have been cut to maximize the carat weight over most other considerations. A poor cut diamond appears lifeless to the eye. Poor cut stone are not recommended for fine jewelry, and we do not offer poorly cut diamonds for sale to our customers. Cut can be something very difficult for a layperson to evaluate, which is why it is important to buy a diamond that has been certified by a reputable diamond lab, verifying the quality of your diamond. A well cut diamond is the secret to a beautiful and brilliant diamond. Like beauty itself, the true meaning of “well cut” is often found in the eye of the beholder. While you may prefer a particular set of proportions, someone else might prefer slightly different proportions. Personal preference, even among experts, will always be an issue in defining the best cut. Most diamonds look white, but there are many subtle shades. The closer a diamond is colorless, the more valuable it becomes. Diamonds with no hint of color at all are very rare, and are called colorless. In the United States and around the world, colorless diamonds are graded on an alphabetical scale, introduced by the Gemological Institute of America (GIA). Grading laboratories use a color scale that ranges from D (completely colorless) to Z (strong yellow). Diamonds of color grade D are very rare, and extremely valuable. Diamonds ranging from D to F in color have virtually no color tone and are the most valuable. Diamonds in the range of G to J are almost colorless and most people cannot detect color tones in them, they are less expensive. Diamonds of K color and lower have enough yellow color tone which most people can easily detect, nevertheless, these stones can still make fine jewelry and their cost is much less than higher color grade diamonds. Depending on the stone’s size, a single increase in color grade can boost the value of a diamond by thousands of dollars per carat. A traditional engagement diamond is usually colorless or near-colorless. In nature, diamonds can also occur in shades of red, pink, blue, green and deep yellow – These are called “Fancy diamonds”. When we speak of a diamond’s clarity, we are referring to the presence of identifying characteristics on and within the stone. While most of these characteristics are inherent qualities of the rough diamond and have been present since the earliest stages of the crystal’s growth below ground, a few are actually a result of the harsh stress that a diamond undergoes during the cutting process itself. If you think about the incredible amount of pressure it takes to create a diamond, it’s no surprise that many diamonds have inclusions—scratches, blemishes, or non-diamond mineral material—on their surface or inside. Diamonds with no or few inclusions and blemishes are more highly valued than those with lower clarity, not just because they are more pleasing to the eye, but also because they are rarer. Diamonds are graded for clarity under 10x loupe magnification. Grades range from Internally Flawless, diamonds which are completely free of blemishes and inclusions even under 10x magnification, to Imperfect 3, diamonds which possess large, heavy blemishes and inclusions that are visible to the naked eye. The Clarity of a diamond is based on the number, location, size, and type of inclusions found in the stone. An inclusion is an imperfection or trace mineral in the stone that is visible under the magnification of a jeweler’s loupe. The fewer inclusions the diamond has; the clearer, more brilliant and more expensive the diamond will be. A “Flawless” diamond is one that has no inclusions and is extremely rare and valuable. F-IF: Flawless or Internally Flawless. Diamonds in this range have no internal inclusions. Very rare. VVS1-VVS2: Very Very Slightly Included. Inclusions are tiny and few in number and are very difficult to detect, even under 10x magnification. VS1-VS2: Very Slightly Included. Inclusions are small and are generally invisible to the naked eye and seen only under 10x magnification. I1-I2-I3: Included. Inclusions are large and/or numerous and may be visible to the naked eye. 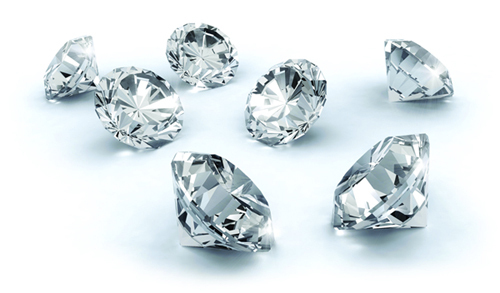 Diamonds with a grade of I3 are generally not considered jewelry-quality and they are not sold by Jewelry Warehouse. While the presence of clarity characteristics do lower the clarity grade, and therefore the value, of a diamond they can also be viewed as proof of a diamond’s identity. Most AGS and GIA certificates (except for dossiers) include what is known as a “plot” of a diamond’s inclusions. (Dossiers identify diamonds with an inscription number and a written description of the main clarity characteristics instead of a plot). Since no two diamonds are exactly the same, comparing the uniqueness of your diamond’s clarity characteristics with the plot provided on the diamond certificate offers assurance that the diamond you pay for is the same diamond you receive. One of the most important factors in purchasing a diamond is the ‘carat weight’ – it determines the size, and appearance of your ring or jewelry. The carat weight alone is almost meaningless unless you also consider the cut, clarity and color of the diamond. A large diamond is not very valuable if it lacks brilliance, purity and high-grade color. However, since larger stones are rarer than smaller ones, diamond value rises exponentially with carat weight. Therefore, a diamond weighing 3.0 carats, will always be worth more than three 1.0 carat stones of the same quality. No two diamonds are exactly alike, and you must weigh all of the factors – color, cut, clarity and carat weight – when making your diamond jewelry buying decision. How important size is to you is probably contingent on how important it is to the person you’re giving it to. A few tips to keep in mind will help guide you to the right decision. The general rule of thumb when buying a diamond is “two months salary”. This is just a guideline, it’s not carved in stone, but it’s useful in establishing a budget for how much you can comfortably invest in her diamond. Deciding on carat size is really about striking a balance between size and quality. If she prefers larger jewelry items, and you are working within a budget, you can still find a larger diamond of excellent quality gem by selecting one which is graded slightly lower in terms of color and clarity. Remember that slender fingers make small diamonds look bigger. If she has small fingers, a 1-carat diamond will look proportionately large–and an even larger stone may appear stunningly big! We hope this information helps you a little bit more! If you have any questions, please come into any of our 4 locations and we will be happy to help you pick out that perfect diamond! In tomorrow’s blog post, we will talk about diamond shapes! This entry was posted in Diamonds, Jewelry, Jewelry Guides, Jewelry Tips and tagged 4Cs, carat weight, clarity, color, cut, diamond, diamonds, jewelry warehouse. Bookmark the permalink.